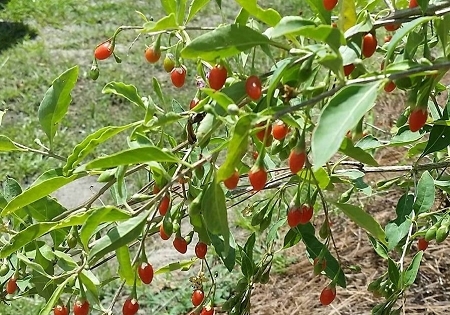 Goji Berry (lycium barbarum) also called Chinese Wolfberry. Small red fruits are packed with antioxidants and vitamins. Used for centuries in China to maintain a healthy immune system. They are quickly gaining popularity here in the states for their wonderful health benefits. Fruits can be eaten fresh, dried, baked, cooked, juiced, etc. Easy to grow bush up to 8' tall. Produces loads of small purple flowers quickly followed by red edible berries all summer long. Plant has long straight thorns! so please use caution when harvesting. Easy to grow, not fussy about soil conditions, grow in sun or part shade, drought tolerant once established. Can be grown in a large container. Non-GMO. Easy to grow perennial bush zones 5-9. Live plant in 3 inch container. May be shipped dormant in winter.